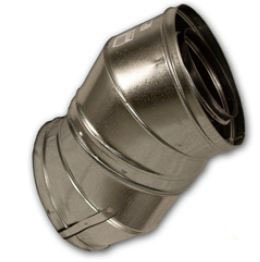 Available for 8" and 12"
IHP/Superior Wood Fireplace 30 Degree Elbow for 12 Inch Chimney Pipe - Pair. Only IHP/Superior Chimney Wood Fireplace Chimney Liners and Chimney Liner Accessories are approved for use with IHP/Superior Wood Fireplaces. They are UL approved and are not for use with any product other than IHP/Superior Wood Burning Fireplaces. How much rise is gained when combining the two elbows by themselves? With just the two elbows on 12DM, it would give you a rise of 16 3/8 inches. How much of an offset is there with this 30 degree elbow for FMI/Superior 12 inch diameter woodburning chimney venting pipe? The two elbows together offer 4 3/8" of offset.